Last edited by MRandall25 on Sat Dec 08, 2012 8:30 pm, edited 1 time in total. Rylan wrote: I definitely wouldn't be against a the draft classes or expansion classes. Definitely would allow some creative freedom. All time drafts would be overwhelming. As would O6 now that I think about it. But I think we have more interest than the 7 or 8 that applied for the roles. I agree. We'll discuss it further after we do this thoroughly and completely. To be honest, if we had an All-Time Draft here at LGP, I probably wouldn't be able participate. So much research, I've already started preparing for one I'm going to be in months in advance. I couldn't do two! I like that "Suddenly, we're down to 6 teams, who would you take?" idea. I've been debating between a few guys here and I think this is the best fit for the team. I have two elite playmakers on the first line (Apps and Jagr) and I need someone that can do the dirty work in the corners, score with elite players and hustle around to be the defensive conscience of the line. Lucky for me, there's a guy on the board that fits that description quite well. As you can tell by the caption, he's kind of a big deal. EDIT: in the spirit of full disclaimers: the way I originally drew this line up, Lowell MacDonald was the left winger. Not getting him has stung the most for me. A good offensive defenseman who can put the puck in the net. I think he would be a solid fit in my top 4 and on my top powerplay unit. Haha, well, indeed it is. Wish I could take some credit for it, but it was sitting on the scrap heap that is Google Images. I thought it was appropriate. Bodger was on my list of "players I might be able to steal later" - solid pick. He was held down here by coaching a little bit. It seems that he could have done more for us if he was allowed. It kind of soured him on the organization a tiny bit and then he was traded for a sourpuss himself...in his time here though, to my best knowledge, he was a major minute-getter and was on the top PP unit every year he was here, even when Coffey arrived in 1988. Last edited by mikey287 on Sat Dec 08, 2012 9:31 pm, edited 1 time in total. Also, for the record MRandall, Nedved wasn't going to get beyond my pick. He was next up on my board. I lucked out since it would probably have been a rather bad idea to take him on my team. I was thinking hard about picking Boudger, but I've never seen him as a Penguins and wasn't sure how he fared in his first years in the league. Based on my readings (I have considered him for about 2-3 rounds and had him on my radar since about 4 rounds ago) he fared pretty good and got better the older he got. Sorry about the delay guys. I grabbed the Otters game tonight. I'm on my phone so I hope the google doc is where it needs to be. I'm going to select Johan Hedberg as my starting goalie. With the last pick this round, I'm going to take Zarley Zalapski. And to start off the 8th round, I'm going to take goalie Ken Wregget. meow wrote: I'm going to select Johan Hedberg as my starting goalie. Hmm, not really who had in mind for "next goalie" - hopefully you'll present a convincing case for him. At a glance, I'm not sure he's even "next next goalie" - but maybe I'm looking at it differently. Enjoy the game, I hope there's discussion about Moose when you get back to a computer. MRandall25 wrote: And to start off the 8th round, I'm going to take goalie Ken Wregget. That is who I had in mind. @all: Is there a case for Wregget being better than Binkley? Am I out to a late lunch for even suggesting that? But I won't, cuz I'll probably lose that one. That's tougher to argue. The coaches (and there was many of them throughout the 90's) pretty much decided that Barrasso was the guy, sometimes in spite of himself...unless there are some sources that suggest Wregget was better during his time here, the actions of the coaches speak too loudly on this one for the stats to make any meaningful difference, I feel. In my Barrasso profile, there's a line that flat out says, (paraphrasing) "No offense to Wregget, but Barrasso is better." - that's generally not something you just say if there's even a little bit of doubt. Think Martin Biron maybe. High quality backup and can play for long stretches in a pinch...but can't quite hack it as a full-time starter. I'm certainly open to any sort of analysis you might have or can drum up though, I'd encourage it. But I think a case would need to be made to leapfrog Binkley before you go after a goalie that was probably the best in our history or extremely close to it. Was Barrasso that much better than Wregget? I mean didn't they really split time for years? Rylan wrote: Was Barrasso that much better than Wregget? I mean didn't they really split time for years? So in this timeframe when Wregget was on the team, statistically, Barrasso was just a little better (could argue his #'s were inflated in 1992-1993 due to how freaking good that team was, but I feel like it wouldn't matter), but like I noted, the similarities between their 93-94 numbers are nothing to be overlooked. Wregget was your perfect #2 guy who could come up and still be a viable option as starter (similar reasoning is what brought Tomas Vokoun here). That was my only real argument to the contrary. Otherwise, I would probably have completely disagreed with you if anyone tried to argue that Wregget is better than Barrasso. I wasn't sure whether to take Binkley or Wregget, but in the end picked the starter. As much as I liked Kenny, who certainly played too many games to be labelled a career backup, he was always meant to be the #2. There is, however, no doubt in my mind that Barrasso, when healthy, was the far superior goalie. Just mho. Basic information presented, time to dig deeper. As we've seen already, Barrasso vs. backups/other goaltenders in the profile created for him (page 8) and now you've presented Barrasso vs. Wregget directly. Of note, Wregget was acquired at the 1992 deadline, his stats are missing in the above table despite receiving 40% of the starts down the stretch for the club - a significant number in context. 9 games for a season looks insignificant, but really it was 9 games to Barrasso's 15. Wregget presents a challenge for Barrasso, how did he respond when a competent goalie was brought in and a sub-replacement level goalie was phased out? As you mentioned, health was an issue for Barrasso. This allow Wregget to play quite a bit of time. Including the shortened 1994-95 season. I'm not sure if anyone would care to comment there. But, the season was one of poor quality. Teams had minimal time to prepare for the season and many injuries seemed to occur that year. Lemieux took the season off, Gretzky really showed rust for the first time ever, the unravelling of the Montreal Canadiens took hold. The only noteworthy things that happened were: Jagr takes off, Lindros takes off and the term "neutral zone trap" became a household term. The Penguins got off to an incredibly hot start (12-0-1) feasting on the unreadiness of others with their terrific offense and the emergence of Jagr. Thanks to a relatively friendly schedule (5 weak expansion teams, plus the hapless Islanders, Habs and Whalers who were woefully incompetent that season) to start. As I've mentioned, the similiarities in player type aren't dissimilar to a Martin Biron type. High quality backup goalie that can play longer stretches in a pinch, but not quite starter material because of either physical or mental limitations. January/February: 14-2-2, 2.98 GAA, .912 save pct. March/April/May: 11-7-0, 3.43 GAA, .894 save pct. Whole career. Starter for the 1988 Maple Leafs. October: 7-3-1, 2.80 GAA, .904 save pct. Rest of the way: 2-17-1, 5.30 GAA, .849 save pct. Leafs quickly tired of this and traded him in March. October-December: 13-13-1, 2.84 GAA, .909 save pct. January-March: 9-11-2, 4.17 GAA, .870 save pct. When the Flyers saw something similar begin in 1991, they realized that they had not acquired what they thought they needed and made the move to send him to Pittsburgh without requiring a goalie back. Leaving them with a Dominic Roussel/Tommy Soderstrom/Stephane Beauregard trio for the 92-93 season. Despite Wregget's playoff success in 1996, when the team got into any sort of a remotely tough spot (like losing game 1 to Florida), they immediately went to Barrasso again, feeling that he gave them the best chance to win. Wregget was steady when managed correctly, but overall could not handle the rigors of the starting position over the long haul. Understanding the role of the coach in goaltender management. Scotty Bowman takes over and one of his first orders of business is to replace Wendell Young with a competent backup goalie (Wregget) so that he can properly manage starts. Bowman and his disciples are known for this - there is a post linked in the Barrasso profile that speaks to this. Eddie Johnston - former goaltender, goes on intuition. Can tell when a goalie is "sharp" or not. Rides the hot hand. How many times in a row was Wregget forced to start in the shortened, condensed scheduling in the start of the 1994-95 season? Kevin Constantine - Demands much of his players to protect his goalie from a tremendous workload so that he can ride his starter until he gives (see: his handling of Barrasso in 1998, his handling of Irbe on the expansion Sharks). Unfortunately for Barrasso, his consistency and health left many wanting. So this allows for the comparison to Wregget to even creep into the picture. In reality, it wasn't really that close. Statistics, typically on more defensive teams (1993, 1998) tend to keep goalie stats together. Martin Biron once again provides the example: in 2011 his numbers are equal or better than Henrik Lundqvist's...in 15 years will we look back at say, "if only they had played Biron more, he might have done [this]..."
Hopefully not, Henrik Lundqvist is probably going to put together a HHOF resume, while Biron was nothing more than a quality backup or decent tandem option. Similarly, Barrasso vs. Wregget should be viewed in the same light. Barrasso a weak/fringe HHOF option or top-notch Hall of Very Good option vs. Wregget, a quality backup or decent tandem option. That's why I'm directing the discussion towards Les Binkley. Minor league veteran that couldn't crack the NHL in a six-team league, when jobs expanded and the two-goalie system was beginning to be introduced, Binkley came in at the end of his career and did what he did. Multi-faceted argument: Binkley was a top-10 goalie in the world all this time (6 in the NHL, 3 or 4 in minor hockey, maybe allow for one international player - Konovalenko? Seth Martin?) and finally got his chance with a roughly minor league caliber team made up of minor leaguers and big league rejects and did about what you'd expect (or better in the case of 1968) before trying to cash in in the WHA. Or, was it a minor league goalie playing on a minor league team that was outplayed by his fellow netminders who have more league longevity and adjust better to the slowly-evening talent levels? With the 44th overall pick, Muck Grind and Repeat selects Chris Kunitz. Here we go, my attempt explain Hedberg over Wregget (and maybe is still convincing myself). Hedberg (on his way up) started over Wregget (admittedly on his way down and out) in Manitoba in 2000/01. Both guys used a hybrid/johnny stand-up style. Hedberg played the puck better. I didn't really look at numbers that closely because I don't put a lot of weight into goalie stats. What I did see in the numbers is Hedberg had higher numbers playing a worse Penguins squad. It was a tough pick, and I just about flipped a coin. meow wrote: Hedberg played the puck better. Excellent point that I forgot to mention above. Barrasso's puck playing ability and the breakout vs. Wregget's sub-standard puck playing ability. As dump and chase becomes more prevalent in the league as the 1990's roll through, Barrasso provides the value of excellent puck play and better skating than Wregget that allowed (pre-trapezoid mind you) Barrasso to aid in the breakout. Especially useful given some of the softer, more offensive defensemen we've employed over the course of the 1990's...many Europeans as well who may not be as used to the dump n' chase, high forecheck game that the NHL began to turn to around this time. There's one still undrafted goalie that I'd probably picked ahead of Wregget and Hedberg, but I could be way off with my assessment. Gaucho wrote: There's one still undrafted goalie that I'd probably picked ahead of Wregget and Hedberg, but I could be way off with my assessment. I believe there's one that I would pick ahead of Hedberg. I'm not sure that I've seen one better than Wregget still out there, but I'm excited to hear the case for him - whoever it is. Also would like to hear more about Hedberg vs. Wregget. I have serious reservations about Hedberg, personally. Though I respect what he did for us in the 2001 playoffs (loved him for it) and understood the team's limitations in 2002 (his only year as a full-on starter) and 2003 (as sort of a 3-man tandem, where statistically, he didn't fair as well as two undrafteds). As for the pick, Kunitz was a consideration for my left wing spot on my first line. 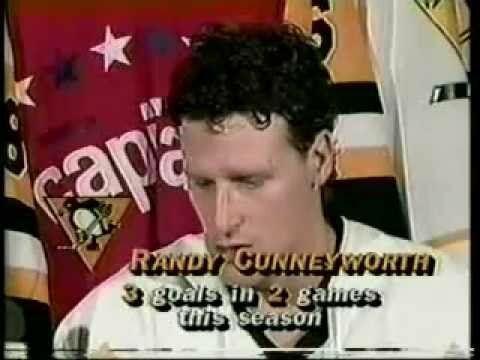 Two factors: Cunneyworth was better defensively probably and has a higher ceiling. Kunitz a steadier player and producer would have been better on my second line I felt. Very close in terms of quality.